A hoar frost. Is it cold, living on a narrowboat? On the roof; yes. Inside; no. – The Diesel-Electric Elephant Company. A hoar frost. Is it cold, living on a narrowboat? On the roof; yes. Inside; no. No, and yes. Yes, and no. Sometimes, but mostly not. In the general run of things, it’s warm – very warm indeed. There is, however, a clearly-drawn line separating “heated” from “non-heated” and “heated” from “outdoors”. Poke a nose into an unheated area and it’s cold. Go outside and you’d better be damned certain to close those doors quickly – a relatively small volume (57′ by 6′ 10″ by 6′ 6″) of snuggly can exchange itself with the same volume of “chuffin’ Nora, I’ve gone blue” in a very short order indeed. Last evening was the first time this autumn that temperatures here in Cheshire were predicted to drop gently below zero, and they did. I heard the “wheeeee… plonk… thud” as the Celsius machine fell off its perch and landed at an opening salvo of four below. 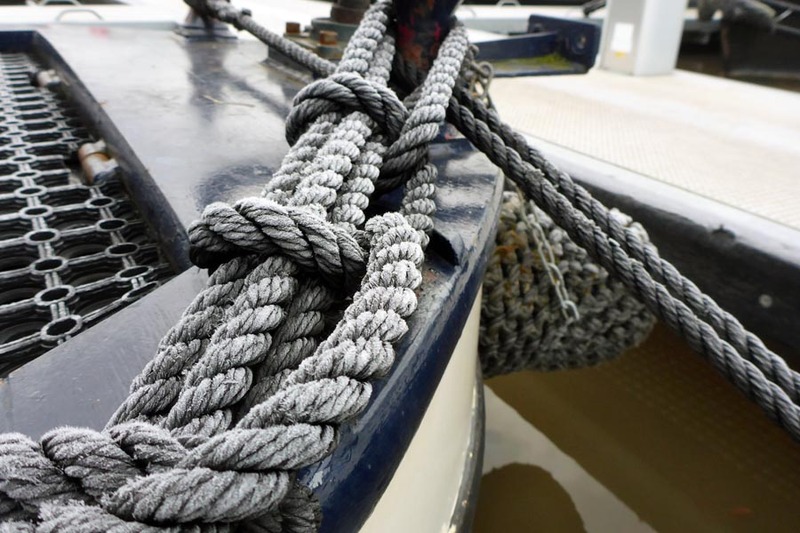 …and ordinary frost on the stern mooring ropes. When I donned my striped flanelette sleeping shirt, hat and customary bouquet-garlique to climb the wooden staircase to Bedfordshire it was a nicely controlled 20°C in the main cabin and 15°C in my sleeping quarters. Twice in the night I awoke to tend to matters informal, so twice I took the opportunity to bung on a few lumps of the old coal. How much coal did I use in the evening and overnight? Two-thirds of a regular bucket of smokeless briquettes and two minor log endings (as a treat when the stove looked about to fall asleep). That’s the most I’ve used so far this year. I somewhat unscientifically estimate that there are some four or five two-thirds-of-a-bucketful in a sack of coal, and a sack of coal costs about twelve quid from the marina’s chandlery. More scientific assesments will follow. In the coming weeks a system will be in place to pipe warmed air from the stove area and fan it into the bathroom and into my cabin, thus upsetting the warm/not-so-warm status quo and evening out the gradient in the boat. The switch is in place, the wiring in place, all that is needed to to physically heft the necessary pipework. Was my nose cold this morning? Nope. Was the fire still in? Absolutely, and very healthy it was too, waking itself fully to eat one of the aforesaid log ends and some more briquettes. A wide circle of “no frost” can be seen around my roof ventilators, the frost here kept at bay by a slumbering Hutson. The sheep in the field next the marina, however, are following their strict regime of perambulations. I do wonder whether they are puzzled by their breakfast arriving covered in frost, or whether it’s all part and parcel of ruminant life. Ooh, Marjorie – grass, my favourite food of all! So what’s it like to wake up on a narrowboat, what’s it like for me to wake up on my narrowboat? Well, sort of magical, even in a marina. The boat dips and rises ever so slightly (in response to other boats moving) and the ropes creak a little. From my fleapit I can see the various LEDs of my machinery, all eagerly waiting for the day. My clothes are all hanging within arm’s reach and my “monster claw” slippers are right where my feet will land when I roll out of bed. The first task (as far as I know at the moment, I will doubtless learn other routines) is to shamble to the pointed end of the boat and tickle and cajole the overnight fire into something more enthusiastic. Then I shamble two-thirds of the way back to the blunted end and stick the kettle on the gas, select Machu Picchu or Kilimanjaro for the cafetière and decide between porridge or toast & marmalade. Once that is set in motion I journey the remaining ten feet to the electrical control panels, flick any necessary switches on or off, check the state of the battery bank charge (the Light Brigade, but they also run things other than lights), and mayhap crank up the sonic oscillators twelve more points. Running the evening laptop, lights and overnight refrigerator usually takes between 5% and 15% of capacity, depending upon whether I’ve also charged up torch/CD-player batteries et al and whether I’ve watched a DVD or boiled a (being lazy) electric kettle. Once coffee has been enbrewinated I hook up the laptop to the interwebnets and check if there’s still an outside world, somewhere out there, and – these days – whether the Cold War III has been officially declared yet or not. Once the coffee has been delivered and eleventy-billion micrograms of caffeine are circulating in my system, that’s it, my day has been begun. Time to consult the jobs list. I can hear others, the rich boaters, running their engines for heat. This is a strange habit and, in technical terms, it is predicated upon burning diesel in a very expensive reciprocating engine designed for propulsion, hoping that the inefficiencies and waste heat will warm up the 200kg of iron, then warm the 30-40litres of coolant, and then possibly warm up the radiators. I say “rich boaters” because running an engine thus clocks up the hours and eats away into the £servicing£ schedule of aforesaid engine. Other boats, like mine, are sending ripples of hot gases through the flue, punctuated by the thin, grey, Gauloises-esque fume of a sacrificial log or two. The heron is nowhere to be seen this morning. I can only assume that he’s booked himself into a nearby Travelodge or B&B or something. Ditto the ducks and tardy geese, although I don’t think they have the means for hotel accommodation, and are probably huddled in a bus shelter somewhere, or are presuming upon the hospitality of the local Sally Bash. I cooked on my stove the day afore yesterday, and surprisingly easy and quick it was too. I think I’ll be doing that again today. A pot-luck vegetable stew, with freshly-baked bread to dunk. As I type this “Red Squirrel” is coming back into the marina, obviously been out for a couple of days’ explorations. Other boats, myself included, flounder about like learner-drivers trying to park articulated HGVs. This guy appears, spins it, slots it in place and ties up his ropes. I think he’s done it once or twice before. It’s impressive. One day, I want to be able to moor like a Red Squirrel. Previous What began in mist wriggled through conduit and ended in light during the night. Next A weekend in Scotty McScotland with frozen eyeballs and the Bro. It all sounds rather lovely and very warm. A pot luck vegetable soup is just the thing for cold days like these. Stay chipper m’dear. It appears that you have settled into a cozy routine. I love your charming euphemism, “Twice in the night I awoke to attend to matters informal”. I’m sure that phrase will rattle around in my foggy brain as I find myself stumbling in the night for such “informal matters”! Tres technical and worked out, sir! Ah, porridge and toast what a wonderful way to begin the day and here I am shivering me timbers and trying not to put the central heating back on. Surprised the Heron isn’t huddled around your flue! Splendid insight to boating life. I recommend a liberty bodice (with or without rubber buttons!) for added insulation.